April 15 — I wrote a short article about the event for Retrogaming Times Monthly, which you can read in issue 59. Enjoy! April 3 — Some photos from the event were in the Davis Enterprise newspaper this week (link via the photos page). Also, Robert Bernardo took lots of video, which has been edited and put online. See it via the videos page. From Combat, Pitfall! and Space Invaders on the Atari 2600 to Tempest 2000 and Battlesphere on the Atari Jaguar, experience 20 years' worth of Atari gaming history, hands-on! Join other Fuji fans, game lovers, and curious onlookers for an evening dedicated to Atari! Relive the past and play the games that started an industry at this free exhibit. Over a dozen systems, covering six Atari platforms — from the 1970s, 80s and 90s — will be on display and running simultaneously! Over 200 games will be available to play throughout the evening! Children are welcome, but parental supervision will be required. Remember that the items on display are from volunteers' personal collections, and in many cares are rare and/or expensive! Also, please be aware that some games include violence (sometimes life-like). 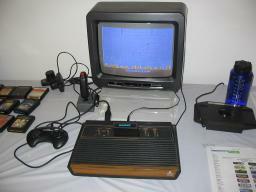 Check out the Atari History Museum, AtariAge and Wikipedia (among other places) to learn more about Atari. Thanks to the Linux Users' Group of Davis, Bravo Sierra Computers, and the various volunteers who are donating their time and equipment to this event!